So often, my husband finds me working on Love Actually and he always says, "Cher, you put so much time into that blog! You could be making so much money if you just sold your ideas." The ideas of turning this blog into a "money maker" have been tossed around again and again....but somehow I'm always led back to just continuing the way I am going. Maybe it's lack of ambition, maybe it's fear of no recognition, maybe it's just a fun hobby that I can't seem to let go of. Or maybe I'm concerned that those who really need the ideas need them to be free! I don't know. I do know that the real reason behind keeping up on this blog becomes very clear when I read something like this. It isn't about the money. It isn't lack of ambition. It's not about the recognition. And, I have plenty of other hobbies to keep my attention. You, who want to love your spouse more. You, who have a desire to make them happy forever. It's such a simple and yet such a significant desire. It's a hard thing to do at times. And that brings you back here to get inspired and motivated. I'm both proud and grateful for all that has come out of this blog. 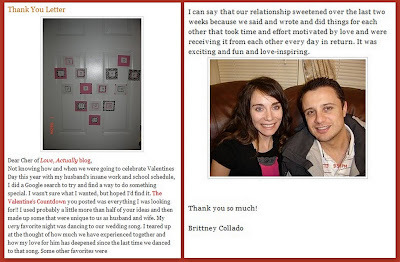 It is a lot of work, but worth it in every way after reading sweet comments like Brittney's and so many others of you who have sent emails and left comments. What a nice letter. That would make it all worth it. Thanks for all you do! I love your ideas! I made clover cash for my husband and he ran around for weeks like a little kids trying to find them. At one point he found my stash and tried to take those. I love that your ideas are simple and sweet and focus on our relationship! If you wanted to make some extra cash with your ideas, write a book! I know I would buy it and keep your blog free, or however. You have amazing ideas! I LOVE your ideas! Especially with my husband still in school and me working, it seems that life can get a little hectic- but i love how simple and sweet your ideas are. Thanks for giving back! My husband told me that one way to make a little cash for for the blog is to have a donate button with a paypal account. I appreciate all of you time and ideas! thanks so much for keeping this a free blog! I love your ideas and it is fun to try them with my husband! I agree that if you wrote a book, I would buy it though! Well I am glad that you do blog! Love your blog! I love you blog!! I agree with the others write a book, i would buy it too. I totally agree with the others. You are amazing with your ideas and my husband loves them. Thanks for having them for free! :) You should definitely write a book! What an amazing person you must be :) I am so grateful that you share your wonderful ideas for free. After having our first baby my husband and I have noticed a significant decrease in romance...your ideas have really helped me to make that effort and I know my husband has really enjoyed the things I have done. Thanks for you taking the time to share your beautiful talent! I am so thankful for you and your husband for sharing your time and ideas. I know Cher from college and she really is an amazing person! SO kind. SO generous. Cher I'm so glad you provide so many fun and romantic ideas and for free. I agree with the others...write a book and get some money for it! Lots of blogs go book...I bet it's not too hard these days! I am a huge fan of your blog! Like many are these days, we've been hit by the economy and appreciate things like this that can brighten our lives, free of charge. I am a HUGE fan of your blog. I just found it not too long ago. I have use several of the ideas. We have 6 kids and my 92 yo grandmother moved in with us 4 months ago. With our very hectic schedule, he puts his name on certain nights on the calendar and I know in advance to put the kids to bed early and reserve that time just for us. I just went to Target last night and saw that they have a line of bachorlette stuff right now in their dollar bins. Because I have recieved so much inspiration from your site I bought some to change up a little and use for us. I can take some pics if you like when I am finished. It won't be wonderful but it might be a jumping off point for someone else. I just found your blog and I LOVE it!!!! Thanks so much for all of the wonderful ideas! Thanks for the love everyone...I love it! :) reading these comments has been the best part of my entire day by far! Cher, I thank my Father in Heaven often for you! That he created you and that you have created this amazing blog. You have CHANGED my good marriage into a GREAT marriage. I had NO idea what was missing until I found your blog. Your blog is truly an answer to my prayers. I have a loving, exciting, wonderful marriage because of you. I have been good at incorporating your romantic ideas in to my marriage but without YOU I would have never even had the idea that romance was missing or the ideas of WHAT to do SO I thank you, thank you, thank you. You are a marvelous person! Following you from Top Mommy Blogs. And your this post is touching and enlightening. I like you blog's design too. See you around! More Power! Love your blog, and I know what you mean. I dont advertise on my blog because I just dont want it to be about that. it is my online journal not a billboard. I think you could go either way and we would all still love you though. I have really appreciated the time that you have put into this blog. I have a wonderful relationship with my husband but you have helped us to make it EVEN BETTER! Thank you from the bottom of my heart for all of your hard work. I am giving you the Sunshine award. Your ideas are always so great! I'm your newest follower!! I love reading blogs. I agree- your blog is amazing and so are YOU! thank you for keeping this up--it really as made a difference in our relationship too; with 4 little ones I have like 0 time to think of anything creative, and this helps me let my spouse know I still care. thanks for helping all us out here have better marriages! please keep it up! I really appreciate you doing this blog and for giving us lots of free ideas! You are so creative and have helped me so much with my marriage! My hubby thinks I'm creative, wish I could take the credit =) So thank you, thank you! Aw, thanks for that honesty. I LOVE your blog... and try hard to be loving and romantic to my husband (it is not easy, working full time, and taking care of our one-year-old... who am I kidding... its not easy WITHOUT kids either... seems like something always takes priority over "romance"). Anyway... thanks for your blog and for all your amazing ideas!! (I plan to do the Laundry Game this week - we have PILES!!). You could always write a book based on these ideas. I'm sure it would be a hit! I'm also very thankful for this idea of yours; I used it this last Valentines and my hubby absolutely loved it!